Like many artists, Nancy Stamm, studied and refined her artistic skills at numerous workshops and the Art School of Minneapolis. Restoration workshops at the Hammond School in California and gilding workshops in Portsmouth, New York, have increased her natural gifts as a fine artist. 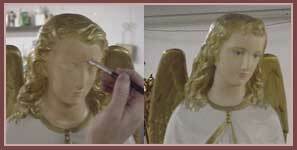 Decorative styles and finishes for commercial interiors, as well as, sculpting skills have given her ten years of very rewarding work in the field of restoration and fine art. 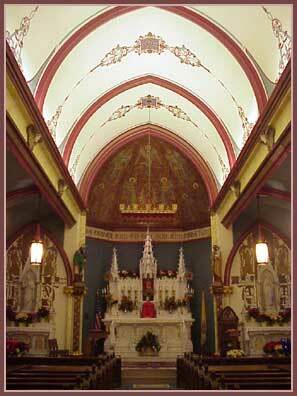 She has to her credit having completed four church ceilings. Her decorative finishes adorn the Penn State Dickinson School of Law, as well as numerous murals, both interior and exterior, throughout Pennsylvania and Maryland. Her special talents are best represented by her designs for liturgical worship. Here sanctuaries whisper with luminescent gold leaf, while elegant designs spiral upwards. Beautiful murals depict religious scenes in the European styles of yesterdays masters, recreating that old world feeling. She is a first rate artist of meticulous and inspired talent. She brings new life and meaning to old and delicate stations of the cross. Under the artist skilled brush the images come to life, speaking softly to those who watch the scenes unfold. Her designs can be complex and intricate, or simple and straight forward, depending upon the demands of the architecture. Old faded wooden altars and window ledges are marbleized and wet sanded to the smooth luster of stone. Broken statues regain their once splendid appearance as fingers and arms are recreated for the missing pieces. Their finishes are carefully cleaned and refurbished as all dents, scars and scratches disappear. Plain painted columns become marble with capitols gilded in 23K gold leaf. Her mural work is of the trompe l'oeil style, and whether it is on the wall of the sanctuary, or on the ceiling it is the product of a fine artist, Nancy Stamm.